Choosing the Right System, Which Laser or IPL Permanent Hair Removal Machine is right for you? Choosing the right system is the most important step in the entire process of laser and pulsed light epilation (as well as other cosmetic and dermatological procedures). The following guide will help you match the correct system with the general criteria necessary for successful usage. If you are new to photo epilation it is advisable that you consider the DM-6050aDX, SD L-30aDX or IPL-450aDX machines first. These systems are very easy to operate and give excellent results. The output power is ideal for safe and effective permanent hair reduction. You will want to go with a larger beam size combined with greater energy density (fluence) if you are working on large areas to increase efficiency. The IPL650-DX and SDL80-DX systems are perfectly suited for rapid and efficient laser epilation and can clear a woman's legs or a man's back in just about 30 to 60 minutes. The general rule is 54-120 total joules per cm2/second for a QCW (quasi constant wave also known as 'long pulsed') Diode Laser or Intense Pulsed Light. Applying more than 180jcm2/second could burn your skin (while doing little additional damage to the follicles below). How Fast Do These Systems Clear Large Areas? For general comparison, we will look at a 120 square inch (moderately covered) treatment area. This is the equivalent of the average man's chest and abdomen, or woman's upper and lower legs. Based upon these general characteristics it is our recommendation that the DM-4050aDX and DM-6050aDX be used for limited facial areas, underarms, bikini line etc. The SDL-30aDX is best suited for larger (but also limited) areas. The SDL-50aDX and IPL-450aDX are ideal for large (unlimited) areas such as chest, back, legs etc. The SDL-80aDX and IPL-650aDX are best for large areas. 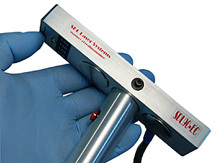 The IPL-850aDX and SDL-100aDX is best used by professionals.